Ferrari Formula One driver Sebastian Vettel likes to name his cars, and this year’s Ferrari is named Margherita, writes Motorsport.com. We don’t care that he was thinking of beautiful Italian women instead of pizza: this makes us pretty hungry anyway. It is a name first of all: Margherita. I think if you look up, the first thing that comes up is a name not a pizza. We just like the name. Every year we gave the car a name. Last year Eva, this year Margherita. Fair enough. 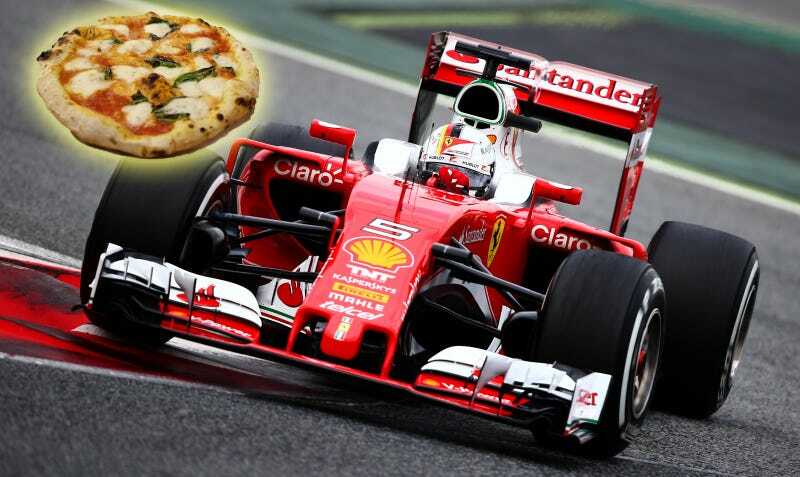 I’m sure Margheritas all over the world secretly want to give Vettel a high five for pointing this out, having long suffered the indignity of being immediately associated with delicious pizza. Not to be distracted too much by lunch—is it time for lunch yet? Pizza has been mentioned. I mean, um, yeah. Vettel also mentioned during the same press conference that he and the Ferrari F1 team are optimistic about Margherita the car’s (not the pizza’s) performance. The team started early last year on this year’s design, which they hope will be enough to catch up to the dominant Mercedes cars. Here’s hoping the car is as good as the pizza, then. It’s really good pizza, and I hate tomatoes. Margherita pizza is really the only time I ever tolerate slices of tomatoes on anything. Sort of. Sometimes I pick them off. That’s how good margherita pizza is, though. I’ll eat it anyway, despite the fact that tomatoes are gross. See, Margherita is a good name for a car.